I remember seeing the Broadway national tour of the Tony-winning The Drowsy Chaperone and thinking simply, That was a lot of fun, now I’d better get something to eat. But when I saw it at Artistry at Bloomington Center for the Arts I was utterly inspired. Formerly known as Bloomington Civic Theatre, Artistry has come to equal Theater Latté Da and Chanhassen Dinner Theatres as the region’s top organization for musicals. So if you haven’t checked them out, then Drowsy is definitely your ticket. FYI: when I have relatives in town, we go to Bloomington Center for the Arts, the Guthrie, and a smaller theater of choice. The production’s brilliance steers from the directorial and choreographic vision of Michael Matthew Ferrell whose production of Hairspray last year also outshone that show’s Broadway national tour. I bring that up because the thousands who have seen these tours locally may have been left wondering, so what? Whereas when you see a Ferrell rendition, you are getting what the musical was meant to be in the first place. Tod Petersen plays Man in Chair, the protagonist who sees a 1920s musical come alive in his New York apartment when he plays a static-riven recording. It’s magical realism on stage mixed with screwball comedy pizzazz. Spoken like a true aficionado, this man captures the spiritual essence of why we love musicals and live performance. He is like a live primer in audience appreciation and Petersen’s performance is fabulous. 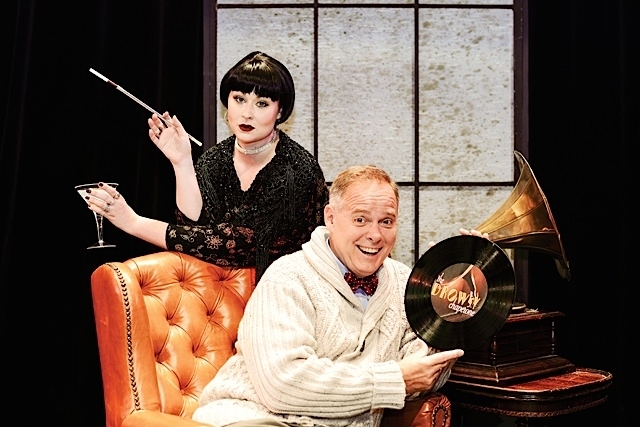 The musical’s book by Bob Martin and Don McKellar is deliciously witty. Brittany Parker is wonderfully ironic in the title role, a woman who staggers about a bit too much, has seen too much, and would just as soon have another drink. Yet it’s impossible to judge her as she is so much above the foibles of those around her. Be warned, this is a very politically incorrect show. Angela Steele crackles as Janet, the musical’s romantic heroine whose materialism and insecurities are delightfully way over the top. Steele is a singer-actress to watch out for. She’s a bundle of talent. All vocals of the music and lyrics by Lisa Lambert and Greg Morrison are solid and often splendid. Anita Ruth’s musical direction is vibrantly dynamic. Ferrell’s choreography is jazzily exquisite to a person. Every single performer in this large ensemble is the cat’s pajamas. Some of our favorite veteran actresses like Kathleen Hardy and Wendy Short-Hays are in top form amidst a young cast that makes one feel optimistic about the future of musical theater. And this outrageously optimistic, albeit shamelessly fluffy show, is the perfect outlet for that!